Personal Loans are simple loans……Yes, it is but you need to pass some basic criteria. Banks and financial institutions have specific parameters; the applicants need to meet so that they can get their personal loan approved. Amongst the various conditions implied today, a good credit score is one of the most critical factors. It is the credit score that grades your financial health and lets the bank know whether you have can repay the loan or not. It showed the previous track record of the applicant and based on it; the bank decides whether or not to approve the loan. Various credit rating agencies will let you know your credit score. You can also check the score online or speak to your bank about it. Fitch Ratings, Moody's investor services, and S&P are some of the popular credit rating agencies that will help you find out your credit score. What is the minimum credit score for personal loan eligibility? 300-599 – If you have a credit score in this range then you might not be able to qualify for the loan. Such a score reflects poor credit behavior and is a warning sign for the lenders. Most of the banks and financial institutions will reject your loan application. It is time that you must speak to your bank about how to improve the credit score. 600-749 – This is a decent score, and the bank might show interest in your personal loan application. Some of the elements banks may consider this as a decent score and approve your loan. In case you have credit score falling in this range than banks will take into consideration other factors that will assure the bank that you would be able to repay the loan. Some of the factors that banks would look at include the status of employment, monthly salary, other liabilities, etc. 750 and above – This is a perfect credit score. If your score is above this, banks would easily approve your loan application. Having a good credit score will make it easy for you get your loan approved faster and hassle-free, the loan amount might be more significant and you might be able to get a lower interest rate. To sum it up in simple words, the entire loan application process becomes simplified. 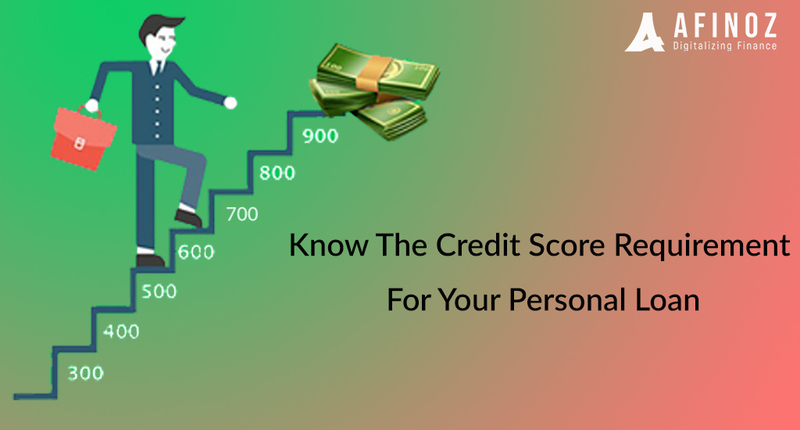 As far as the minimum credit score for Personal loan is concerned, then the banks usually ask you to maintain a good credit score which should lie in the range of 650-750. If it is above this range then it is exceptionally well, but it is advisable to have a minimum score of 650 for you to have hassle-free loan approval. However, in case even if your CIBIL is very poor, you can come to Afinoz. We will help you avail the best personal loan interest rate from Vintage Finance. We don’t charge from a customer and even offer them 1% cash back on the disbursed loan amount. T& C Applied.